If you are looking for the best Sage Pay review online, then look no further. Merchant account services are a crucial part of payment processing, but with literally hundreds of options to choose from, picking the best for your business can be overwhelming. However, every merchant service provider offers something unique, so you can choose a merchant account based on your business needs. Let’s take at look at one of the largest, SagePay. Sage Pay is one of over 100 merchant service providers in the UK, and one of the largest catering to small businesses. As part of the Sage Group, the British multinational enterprise software company headquartered in Newcastle upon Tyne, and owner of Oracle and SAP – Sage has a long history of offering local UK and global small business solutions. Sage Pay offers extremely transparent pricing and fees, making it easy to see where and why you are paying. The merchant service account provider offers four basic services, each of which are available at multiple levels. Custom and bespoke pricing is available for almost all high-volume accounts. Sage Pay charges flat rate transaction fees on most transactions. These fees will vary slightly depending on the service offering you are using. In most cases, Sage Pay’s offerings range from average to just above average cost. Sage Pay is a merchant account solution designed for small and online businesses – making them ideal for a range of companies including start-ups, small business, Amazon and e-commerce sellers, and other non-traditional business models. Card Payments – Sage Pay accepts credit and debit card payments in 25 currencies, with all major credit and debit card schemes are accepted. Alternative Payments – Sage Pay allows you to connect all major payment processing gateways such as PayPal, Google Wallet, Apple Wallet, Skrill, etc., to your store without having to seek out an individual merchant account for each. Fraud Prevention – Sage Pay provides free integrated security tools including 24/7 monitoring, flagging systems, and PCI 1 compliance. 2-Business Day Funds Processing – All funds are processed and transferred within 2 business days, with most transactions finishing within 24 hours. This can be extremely beneficial for smaller businesses in need of improved cash flow – but also improves security by ensuring that funds are processed more quickly to prevent fraud. Sage Pay offers a wide range of Point of Sale machines including countertop, portable, and contactless card readers, as well as EPOS (electronic point of sale) offerings. Face-to-Face payments are supported with integrated payment solutions, offering cloud support, ePOS, and support for all major debit and credit card schemes. While Sage Pay does not typically offer branded premium PDQ machines and terminals, the company does offer a variety of offerings at different price points for businesses of all sizes. Countertop or Contactless – Sage Pay offers multiple countertop credit card machines with integrated POS (Point of Sale) or ePOS (Electronic point of sale) on every till with a Pin Entry Device. These terminals are ideal for businesses that accept face to face payments in a fixed location, who don’t have a POS system. Mobile PDQ – Mobile PDQ terminals connect to a network over GPRS, making them ideal for accepting payments at varying locations. These terminals are ideal for contractors (like plumbers), caterers, and other small business who typically work on location rather than at their place of business. Portable PDQ – Portable PDQ machines connect to a network over short-range Bluetooth, making them ideal for small-mobile operations. Portable machines are most often used in hospitality industry such as restaurants and bars. POS Integrated PDQ – Sage Pay also offers PDQ terminals which can be integrated into your existing POS system. These can be countertop or portable but will not include point of sale software (ePOS). All Sage Pay PDQ machines are available with integrated ePOS with either cloud, shared server, or individual server solutions to connect all Pin Entry Devices to a single account. 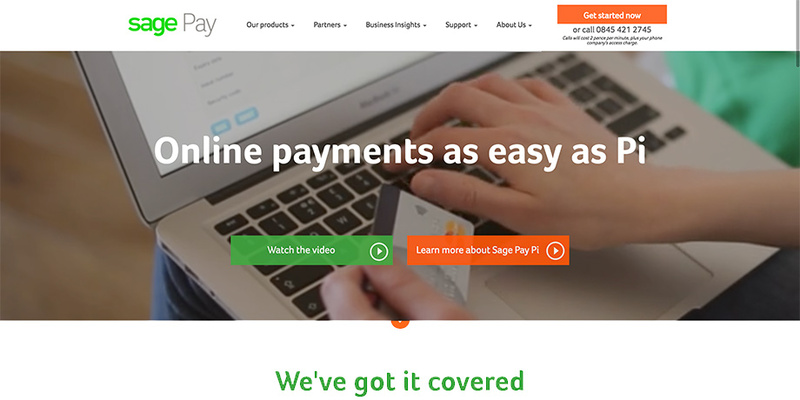 Sage Pay’s largest offerings include online payment gateways, designed for small or large businesses. The basic package costs £20.90 per month, supporting micro businesses with up to 350 token-based transactions per month. The Plus package costs £45 per month, offering additional features and more transactions. Corporate accounts are priced per customer, at a custom range. The online payment gateway is available as Form Integration, Server Integration or Direct Integration. Form Integration – Form Integration is a Sage Pay hosted payment page with customizable templates to help you match the look and feel of the page. The merchant account provider also enables a PCI compliance check for modified pages with a simple questionnaire. This option makes it easy for small business owners to update their site with an online checkout page. Server Integration – Server Integration and In Frame enables you to set up part of the payment or checkout page on your own site or server, without handling cards or sensitive customer data yourself. This simplifies PCI DSS compliance, while giving you more control over the page, data, and system processes. Server Integration is ideal if you want to create checkout pages in unsupported e-commerce platforms, want to link into existing software, or want to use automation to simplify accepting payments but do not want to take on high levels of PCI compliance. Direct Integration – Direct integration allows you to create your own payment page and process payments through your own servers before sending them to Sage Pay. This gives maximum control over the payment process, ensuring that you control security, management, and reporting. However, it is not typically ideal for small business because it requires a high level of investment in PCI DSS compliance as well as additional security measures including regular audits. Sage Pay has a lot to offer for e-commerce and other online businesses, including direct integration into top e-commerce platforms like Shopify, WooCommerce, OpenCart, PrestaShop, and many more. When combined with fraud prevention tools, and small business offerings like multi-channel tracking, so you can see a buyer’s journey across your channels – and Sage Pay is extremely attractive to both new and established e-tailers. Sage Pay integrates with 36+ e-commerce platforms such as Drupal, Big Commerce, Magento, EasyCart, Sage CRM, Salesforce, ZenCart and many more. The merchant account also integrates with up to 3,500 software and e-commerce partners. Sage Pay offers virtual terminals, enabling you to accept card payments via phone and via email for MOTO (Mail Order/Telephone Order). This solution includes full security and all the features of the online payment gateway. Pricing plans start at £15 per month for processing up to 350 token-based transactions, with a business + plan available at bespoke pricing. Sage Pay offers a great deal in terms of free business tools and offerings, primarily designed for small business. For example, Sage Pay integrates with all Sage accounting tools including Sage 50c and Sage One. Sage Pay previously offered a standard 36 or 24-month contract, with early termination fees. Most of its offerings are now available contract free, or on a month-by-month basis. However, like most UK merchant account providers, Sage Pay uses independent resellers. Here, you may run into different contract lengths, different pricing, and high fees – which you would not typically see when dealing with the merchant account provider directly. Many contracts now start off on a 3-month cancellation plan (you can cancel without a termination fee during the first 3 months) after which the termination fee will apply for early cancellation. Costs – Sage Pay offers a flat rate of 1.9% for credit cards, which can be pricey compared to large-business offerings such as WorldPay. However, Sage Pay offers many of their services to micro and small businesses which are higher risk, does not use long-term contracts for all their services, and offers lower monthly fees than many competitors. It is important to review your options and choose the merchant account that best meets your needs within your price range – so that you know in advance if fees are higher than you could get elsewhere. Early Termination Fee including liquidation damages – Businesses with a contract will find that they are charged an early termination fee and will pay liquidation damages for early termination on equipment rental. While Sage Pay seems to have discontinued the process, some customer complaints list fees of up to £25 per month remaining on the contract in liquidation fees on PDQ machines. PCI Compliance Fee – Sage Pay does not include a PCI compliance certificate as part of their offerings. You will have to source it through either on your own or through their own Qualified Security Assessor (QSA) for an average of about £100. Sage Pay mostly maintains a very good reputation, and complaints are generally minimal. Sage Pay offers a lot of support for small businesses, including 24/7 phone support and technical support, free of charge. This is extremely advantageous to most small business, who benefit from having help on call, especially in case of technical or security problems. You can also get support via email, Twitter, and an online monitoring system that works to diagnose issues for you. If you choose to pay for premium support, you also have fast-tracked access to support, personalised reports, and a dedicated account manager to ensure that your requests are handled more quickly. All Sage Pay users have access to a user-based forum. Sage Pay is one of the largest small business merchant accounts in the UK, but how does it compare to competitors? Sage Pay has a lot to offer for most businesses, but it is important to go into any contract with as much information as is possible. Sage Pay uses third-party sales representatives, who earn anywhere from £50 to 25% of your signup payments. This means that if you’re working with a third-party retailer, it is in their best interest to get you to sign up for a long contract, commit to spending more money, and typically pay more per transaction. Deal with Sage Pay directly, you will save time and money by cutting out the middleman. Keep a copy of your contract once you sign up and read the fine print. Knowing how to cancel your contract could save you a lot. Sage Pay typically requires a 3-month notice of cancellation. Go in prepared. You should have some idea of what you are looking for and why, so you can get a good deal on products you need, not an upsell you don’t need. With over 50,000 customers, Sage Pay is a large and well-established merchant account provider, offering solutions aimed at businesses scaling from single entities to major corporations. The company has a very solid reputation for quality service, small-business merchant account solutions, and a simple structure, so that non-experts can use their services. This makes their services especially promising to smaller businesses – but still includes plenty for bigger business as well. However, while flat-rate pricing and a standard processing fee for credit cards can be extremely beneficial for small businesses, you may find that there are much cheaper solutions if you process a high number of daily transactions. Most large businesses will benefit more from a larger merchant account provider like WorldPay or Barclays. Small-to-medium businesses can gain more from Sage Pay, which offers a great deal of small-business oriented software, with a fee structure designed to complement retailers and businesses with a smaller transaction volume.